Ask for pricing for 6 bedroom/3 bath, 7/3 or 8 bedrooms/4 bath when inquiring please. 3 rooms can accommodate your pack and play crib. Sale code STPAT11 for discount, ASK when you inquire. 1. A bedroom with beachy décor, queen size bed, reading lamp by bed, night stand, & dresser. 2. A bedroom with nautical décor room, queen size bed, reading lamp by bed, night stand, dresser with a novel library to enjoy and window seat. 3. A bedroom with palm tree décor, queen size bed, reading lamp by bed, night stand, dresser with a bookcase of magazines & children's books, toy box. The kitchen has a huge CH table that seats 20 +. We are one of the few homes on LBI that can seat this many people at one table in the same room. We are fully stocked with cooking pots and pan of various sizes, baking ware, stone wear, including lobster pots, steamers, clam opener, crab claw crackers, hammers and picks. We have fancy glassware of your cocktail party and huggies to enjoy a cold beer in. 2019 renovation will be bumping out kitchen to expand floorplan. We will be replacing 30 inch range with 48 professional range, replacing refrigerator with a 4 door refrigerator to allow 2 - 3 door for cold food or 1-2 doors for frozen food, stand alone Ice Maker for drinks and coolers, top of the line DW and a larger deeper sink with cutting board and dish drain. We know what cooking for the crew can be like! The open floor plan flows into the living room that has a gas stone-faced fireplace, a full pullout couch, radiant heat throughout home, 42-inch flat screen surround sound entertainment center, pop up table for TV dining, U shaped couches seating for 10 +. There is a washer/dryer closet, pantry closet, & extra pantry/storage shelves by back door. There are 2 first floor Bathrooms, 1st has high boy toilet, medicine cabinet, handicapped rails, bench seat /stall shower for elders needs, & the 2nd bathroom has small storage cabinet, standard height toilet with a shower stall. *4. A bedroom with nautical décor room, queen size bed, with ocean views,reading lamp, nightstand, & dresser. *5. A bedroom sealife décor, dresser, nightstand, king bed. *Used to big oversized room with king bed and pullout couch. We found it wasn't used as family room so we made 2 rooms out of it for more private space. 6. A bedroom with cheery tropical décor, queen bed, dresser, reading books reading light on bed stand/book shelf. 7. A bedroom with beachy décor, single bunk on top of queen bed below, full futon mattress underneath can be used in livingroom if needed, dresser & night stand. 8. A bedroom with beachy décor, King bed, dresser with a attached Nook bedroom with bunk beds and beachy décor. The 3rd bathroom on 2nd is a full bathroom with tub, comfort height toilet, storage cabinet, 4th has storage cabinet, normal toilet & shower stall. Enjoy the ocean & bay views & sun and moon décor in the second Living room. This is a great place to escape to for movie night for the kids, a place to send the second-generation party or to have some peace & quiet when you close the downstairs door. It has an 60 inch big screen TV, popup storage table for puzzles, & game playing. We have over 150 videos from G to R rated movies to entertain our guests. There is a U couch with full pullout couch & leather full pullout sleeper and another comfy pillow couch. The front yard has 3 parking spots and additional 3-4 up the left side alley. Do you need to plug in your electric car? We have an OUTLET on the front porch & on the left alley of house. The back yard has a large teak dining table w/umbrella,teak outdoor living room set, & 48'Weber grill. The outside shower is roomy with a bench. We have a clothesline to help keep ahead of the wet towel syndrome that sometimes occurs at the beach. The 4th floor rooftop deck gives you the opportunity to tune out the world and relax. The hot tub will melt away the worries and let the good times sink in. Panoramic views of the island and surrounding towns over the bridge twinkle at night. You can see Old Barney's Light blip on the left, the causeway bridges rails glow, and to the right the Ferris wheel at Bay Village Schooners Wharf, along with Atlantic City's Outline and shimmering Borgata Casino that changes color every few minutes. The 4th of July is a splendid sight with all the fireworks being at a safe distance away, without all the heart stopping booms. It's nice to have room to sit in comfort and have a cocktail while visiting on the deck when watching the fireworks and the little one’s excitement! Plan your BBQ with friends and dine in the back yard with the large table and bench seating, outdoor living room set, kiddie picnic tables and new grill and large cooler for extra beverages. If you bring your own bikes, please keep them locked up. This home can also be rented as first floor only (sleeps 8/9 w/cot) with 3 bedrooms and pullout couch in living room) including 3 onsite parking spaces, same back yard use and rooftop deck access. (FIRST FLOOR ONLY RENTALS- 3 parking spots are reserved for owner and full second floor lock out for owners use, we do not share back yard or rooftop deck areas- these are for you). Township now offers a transportation option to the beach. All you have to do is call & a Gator(beach buggy) will pick you up,take you down gear & all to the beach. It will pick you back up when called to take you home. If you have bikes bring them, if it's too much to carry, rent them down the street. If you like to fish, bring your gear, or just walk up to the bait shop and buy some new presents for your crew to remember your trip. We have beach chairs and umbrellas for your use, a boogie board and some tubes. The surf shop carries all these items also if you need more or want some other options. We have a toy box with sand toys, and other items to make the beach trip fun for the little ones without packing your stuff from home. We supply 10 beach badges. You are able to buy more if needed. The checkers are not that crazy about taking a head count most of the time. Kids under 12 do not need them. Most kids are under 12 (wink, wink). Volleyball set, badminton set, corn hole, soccer balls, kick ball, beach ball, tennis rackets and balls, pickle ball set, racket ball set, & a football. No matter what weather pack those bathing suits year-round, the hot tub is on the rooftop deck 4 stories up and the views are amazingly soothing. A hot tub certainly takes the sting out of a cloudy rainy day for sure. Here is some of the must do's if you can fit them in to your relaxing visit. Fishing on the Black Whale or out of Barnegat Light. Barnegat Lighthouse trek (214 steps!). Nardi's Tavern (great bands and pizza, free bus transportation to and from daily). Howards Seafood Restaurant (great salmon dishes, and Lobster Bisque!). Bay Village Schooner's Wharf is a must for shopping, Country Crumb in Bay Village has delicious Elephant ear cookies and Choc. chip cookies to die for! Country Kettle Fudge should satisfy your sweet tooth. Just as a FYI, I don’t recommend the clam fudge they offer at Chowderfest first weekend of October! Thundering Surf is fun for all ages with tubing down the lazy river, tubing shoots, a kiddie water playground, a huge mini golf on a 'mountain’, and lots of food and drinks to keep you going. Take a bucket a net up to the Bayview park and let the little ones find all the creatures in the sea, this is fun for all ages! There is also a playground, water sport lessons (SUP, Kiteboarding, Kayaking) and a place to go out on your own water gear, public bathrooms, pickle ball, basketball, bocce ball, dog park, volleyball. Pack a lunch or wait for the ice cream man at the picnic area. (We have the net gear and buckets to take there, everyone over 12 needs a beach badge here- and Joanie is strict with checking for them). Need a wonderful vacation, retreat, holiday stay or want LBI destination wedding? We are ready for you! Do you need help while in town? We can help you with: catering, setting up in house spa treatments, food shopping, arranging rentals for bikes, kayaks, sup's, surfing lessons and more. We offer help to our guests any way we can. During your stay, Owners take of the hot tub chemicals & house maintenance, repairs or emergencies if any. If you have any questions or issues during your stay we are a knock, text or a phone call away to help you or recommend things to go, see or places to eat and coupons we have access to. Please don’t hesitate to ask. The third floor is locked out for Owners who may be present during your stay, with own entrance, and the far right 2 parking spots next to fence are reserved. We do not share the back yard or rooftop deck areas- these are for you. We have our own 3rd floor backdoor entrance and front deck with grill. You can read our numerous reviews that state our renters loved staying with us and our presence was welcomed when needed. If we are here during your stay & you need us let us know. We will say Hi if we see you. Our home is for your enjoyment. Vacation is time to have fun, laugh, & enjoy all LBI has to offer. Fun in the sun, ocean & bay play if our motto! Please knock if we are present, text or call us if you need us. Columbus Weekend = LBI FLY! Sorry NO proms, need to be over 21. My husband Tom and I both grew up on LBI in the summers. We lived next door to each other until age 10. After 30 years we reconnected at age 40! We have raised 4 daughters here and were married on our beach. We married in 2006 bought my familys home and renovated so we could share LBI with others. We have built the house to be flexible with bedrooms and bathrooms needed. Some need more some less. We purposely designed the house to have several places to spread out in different living areas, or gather in one spot, indoors and outdoors. This helps with multi- generational families. We love introducing new visitors to the island and showing them the ropes. We also have a great connection with people who have been coming to LBI and our home year after year. We also welcome groups for retreats. We have retreat groups in the months of Sept.-June. We are currently looking for more retreat leaders to fill some weekends with their offerings. If interested please contact me. We look for all kinds of groups: Ladies, Men’s, Artists, Holistic, Spiritual, Healthy Ways, Networking, Business, and more. We opened the LBI GeoTrail Nov. 2013 ask me about Geocaching! The kids will love it, and it is a great thing to do on those cloudy days! $500 saving with including beach badges in cost of rental. I do milestone event planning: birthdays, anniversaries, repass, christenings, rehearsal dinners, cocktail parties, diner parties, brunches, continental breakfasts and more. If you are planning to have an event please let me know if you need my services. 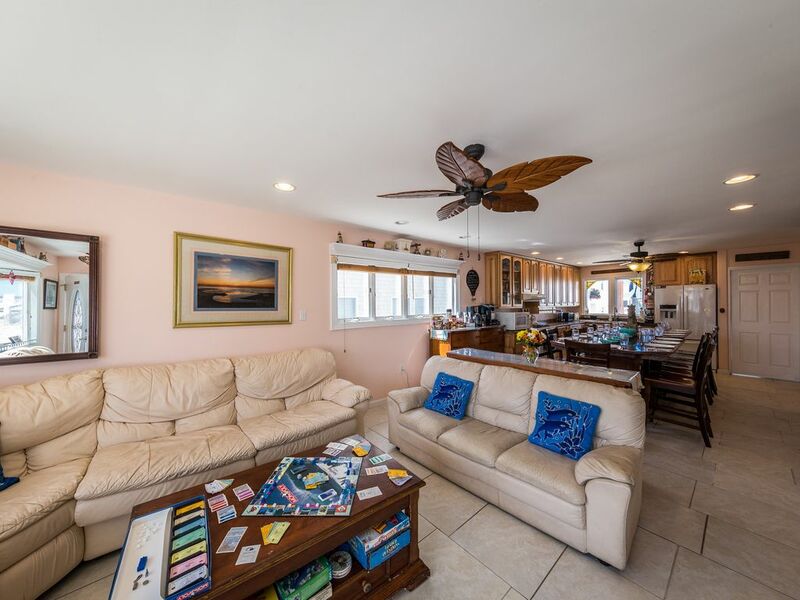 Many homes do not allow parties at their homes on LBI, but there is a need and we have had great success with entertaining for our visitors and have enjoyed their reunion type gatherings. We book for wedding stays and bachelorette weekends. Having raised 4 daughters we have a great understanding of what parents wants and needs are while down on LBI. We suggest what going on for the kids as well as the adults and provide coupons, maps, and brochures for the areas offerings. Sunny days and raining days we have the answers on what to do. Please Don’t Hesitate to ask a question during a stay, and enjoy your beach house retreat with us. Weddings weekends in the shoulder season rent for $2000 per night. With all bookings - 50% of rental fee due with booking, $1500 security and $500 cleaning fee collected with second payment of remaining 50% rental fee due 45 before check in unless other arrangements have been made. When booking with a dog there is a $200 charge for small dog under 15 lbs. and a extra $200 security fee and $100 pet cleaning fee. Up to 25lb. dog $300 dog fee, $300 dog security and $100 pet cleaning fee. up to 40lbs. $400 pet fee, $400 pet Security, $100 pet cleaning fee. Larger dogs with be considered please ask. There is a $50 per person , per night for sleeping more than 19 -(20 max.). Smoking Is Not Allowed. If evidence of pets or smoking are found, a portion of the security deposit may be held. Please let me know if you have pets or need the bed/bath linen services so I can add the charge to the lease. Cancellations will gladly be refunded if we can rent the house out for the timeline at the same price. toilet, combination tub/shower, Comfort height toilet with linen cabinet & medicine cabinet. If you rent with 6 or 7 bedrooms you will have 3 bathrooms. We have installed 1 regular toilet and 2 high boy toilets which are taller than normal so elders have a easier time at it (one less normal height with renting 6 or 7 bedrooms). The first floor bathroom has room for a walker or wheelchair to get into it if needed. The rails on the walls and shower bench are added for more safety while getting in and out. Steps to the beach. We are one of the selected beaches that is gaurded for swimmers and surfing. The Surf shop has rentals, lessons for surfing and SUP. Kayak rentals are also available. We have a Acme Food Market, ice cream shop, 4 restuarants, liqour store, fishery, bait and tackle shops, bike rentals, kayak rentals, surf lessons and rentals, SUP rentals, 2 gift shops. You can hit it with a stone it's so close! Not many rentals on this street, it is a nice safe street for children to ride baikes and get around on their own. 3rd from the beach, great for the elders and the little ones to get back and forth to use the bathroom. Amazing Ocean Views from the second floor Living Room, King Bedroom, and rooftop deck is breath taking! You can see the bay and watch storms roll in from the mainland. Central Air, and a additional ductless AC unit on the second floor living room when needed. Please make sure all windows are closed or unit will shut off, not sensing sensors on closed windows. Radiant heated floors are the best, forced hot air if needed in back up( rarely must be 0 degrees for several days), gas fireplace in living room also vents to second floor for a boost or ambiance. Sheets, pillows, and quilts are provided. For the off season use only - Please ask to use if it is cold early on or late in the season for some odd reason. Mother Nature Behave! 5-7 cars can fit in lot depending on size. Additional parking can be found on street, or up the block in a large parking area for the nearby businesses. Bathroom towels are provided. Please bring your own beach towels. Great DW!, and a Dish Drain under sink if needed for a quick clean up. Large Samsung 4-Door Flex 28.1-cu ft French Door Refrigerator with Ice Maker. Use 2 or 3 doors for fridge use. Huge cooler out back for drinks/beer/ etc. 48 inch stove top with griddle. We have a extra large electric griddle also if needed for an occasion. We have a drip coffee maker, coffee press, Keurig at our coffee bar. Toaster for 4 slice, and a toaster oven. Counter height dining table with seating for 20+. We have a side buffet that can be used for the extra 7 persons if needed. Large 42 inch flat screen TV in first floor living room, Huge 60 inch flat screen in second floor living room. We have tons of magazines, books and paperbacks. Kids board books, paper backs, and hard covered books, as well a wonderful animal book library. Kids love the books we have for them. We have cards, puzzles, games, Frisbees, football, volleyball net and ball, tennis balls, kids toys, sand toys, and boogie boards for your enjoyment. Duplos, legos, puppets, Mr. Potato Head, Noahs Ark, Little Tykes, Blocks, outdoor games and more. We have a huge selection of movies to watch while you in town. G-R rated. Newer movies we rent we will ask if you want to use before we return as well when we use redbox. Large back yard, with outdoor living set, dining table with umbrella, Rack for beach chairs,umbrellas,beach toys & gear. Rentals right up the street for ocean riding or bay tours. Bikes, kayak, surf boards, and stand up paddle boards can be rented up the street or bring your own. 'I gotta guy'... that does booze cruises, bay island shell tours and exploration, bar hops, romantic dinner cruise, golf trips, AC trips, fishing, and performs weddings. Large dining table,large pit couch, coffee table,couch,2 chairs & table,2 chaise lounges with table,hot tub with amazing views from 4 stories up above the island. Views are amazing! the 4th is grand! When we have snow, bring you snowshoes or cross country skis and hit the beaches! Bayview Park has a bay beach, kids beach & playground. All kinds of activities: Basketball,horseshoes,several type water sports,& ice cream man visits:) Tennis Courts moved to the ACME MKT side lot. Mini golf is all over the island, and there is a selection of golf areas to choose from off the island. You can take a boat ride to get to one of them, ask for details. Check back in 2020 we are waiting for approval to add an elevator. Seats 6. Please remember to put hot tub cover back on with straps after use. High winds will pull cover off and send it flying. I have several retreats in the off season: Scrap-booking, French Cuisine Cooking Classes, Painting Workshops, Stain Glass/Mosaic Workshops, Baking Classes, Massage/Spa Treatments, Yoga/Pilates, Raw Food Diet and Preparation Workshops, Tye Dye Workshops, Writers Workshops, Fishing Charters, and you may also bring your own retreat group or request us to help put something else together for you that you have in mind. If you are interested in creating a partnership in the off season I would lover to talk about your ideas and class offerings. I have access to caterers if you don't want to cook on vacation, from a Welcome Hor'doures, Continental Breakfast, Brunch, or a Full Course Meal. Please reserve before your week so I can assure the Chef is available. We welcome wedding groups for their Destination Weddings. I am a member of the Jersey Shore Wedding Association and have several connections for what it takes to put on a glorious wedding weekend for you and your loved ones. Five family went for our yearly meet out. Very close to Beach, just a min walk. House was kept very clean and themed with small toys. Enough parking. Very close to shops. We loved the stay. Pets policies are Ok, but we didn't prefer due to high cost. That aside, the owner was very helpful and friendly. The roof top HotTub and the view from there to Beach was amazing!!. We will surely visit after few years. We had a fantastic week at the house in August. Hot tub and porch on the roof were great - especially at sunset! Location to the beach (5 minute walk) was so convenient. Really appreciated that lots of beach chairs and a few umbrellas were available at the house for our use. Lots of stores and restaurants easily accessible. House was laid out nicely for a big group. Owners were very nice and extremely helpful with lots of information about the area. Thank you so much for the review Lisa. We love when our guests have a great week and have everything at the house they need to relax and enjoy LBI. We hope to have your crew back soon! Enjoy the rest of the year! The huge dining table is a great place to gather and share ideas. The house has indoor and outdoor places to gather and/or spread out in groups to deliberate ideas. The house is perfect for day meeting, networking or a project working weekend. Great location that I have had meetings at both in and out of season with the owners! I hope to have some meetings in the fall. We hope to see you then! Had my 60th Birthday party with 20 of my closest friends, it rained the day of the party but the house was so large it accommodated everyone for an indoor party. We were all very comfortable and the 6 bedrooms slept all of us. The house is located just a few yards from the beach which was great, no long walk from the bay to the ocean like we usually do. Also don't be alarmed by the owners living a section of the house. Mary Ann & Tom was none intrusive but were available if needed. Lovely people also. If your looking for a nice house thats close to the beach and all the fine restaurants that LBI has to offer this is the house to rent. We also took our two dachshunds with us and they loved it as well. Oh, how could I forget the rooftop hot tub with the beautiful views of LBI. We hope to be able to visit again sometime. It was so nice to meet you and your family. That you for the lovely review. We hope you will come back some day to celebrate another milestone event with us. Say hi to those crazy Weiner dogs! Group gatherings at the Beach House Retreat! I've attended 3 different gatherings at the Beach House Retreat and it is the PERFECT place! If you are planning an office meeting or girls Weekend or business seminar, family reunion, birthday party.....any time you need a large but intimate space you must consider coming here! Let your ideas flow.........with a home setting opposed to a hotel where there really aren't meeting rooms on LBI. There is a large table to congregate with a sitting area. There is also the outdoor space. Plenty of sleeping too if you are staying overnight or the weekend. Steps to the beach is an added bonus. And Mary Ann and Tom will help you plan from start to finish if needed!! I just can't say enough, check it out for yourself. Meeting season is coming up! I hope to get them rolling soon! Let me know if you want to hold one here in Sept. The house for the weekend was amazing! Its proximity to the beach makes it the ideal place to stay in LBI. Nine of us stayed in the house for a bachelorette weekend (all with a bed) and could not have asked for more. The rooftop deck is a great spot to entertain and the downstairs kitchen fit us all comfortably. Mary Ann and Tom were so willing to help and are just the kindest hosts we could imagine. I would definitely recommend staying here - we are trying to come back here next year ourselves! No Prom Groups please. Must be over 25 to rent. We can shut down the first floor that sleeps 8 if you need a smaller unit. We book for Wedding Stays, Reunions, Bachelorette Party Weekends, Bring your own Retreats or do ours, Business Meetings, I also have access to more homes on our block if your group wants to stay all together. We are located in a very family friendly area. There is plenty to do on foot without starting your car once you roll into to relax. For meals you have several options: Joey's Pizza (great to send the kids to for a slice or subs), Pinky's Shrimp( fishery for you to cook yourself, take out meals or eat at outside there, Pinzamino's Italian Restaurant (BYOB, Fancy), and Kubel's Too Tavern (fantastic Happy Hour 4-7 daily,cheap drinks and apps, nice menu altogether. When cooking in: Acme Market and Dune Produce Farms Market should have you covered. We are a guarded surfing beach and have 2 surf shops at the end of the block one gives lessons and carries most beach needs, candy, chairs etc, the other rents bikes and has roller blades, clothes and such. There are 2 ice cream shops in opposite directions, a gas station, and a pottery store with unique gift ideas. There is a 4 plex movie theater and a bait shop for the dormant fisherman. These 13 shops pretty much cover most ages needs. My Husband Tom and I and 2 of 4 daughters live here in a lock out part of the home. LBI is such a wonderful place to raise a family, and have a small town life, with a fast paced summer to enjoy. We enjoy meeting new people and sharing our home and love of LBI to long time renters to LBI and showing Newbies to the Island the why it is such a hot spot year round now. Tom and I have grown up on the island in the summer months and moved down full time in 2006. We got married on our beach and it has been bliss ever since. Come stay with us for your vacations, reunions, wedding stays, bachelorette weekends, and retreats. Book one of our retreats we offer or bring your retreat group with your goals in mind. Discounted pricing in the off season Sept.-May. We look for new retreat partners that want to expand their offerings by adding retreats to their business model, contact us for more info. Owners live on site and now offer wedding/milestone event planning and concierge services to vacationers, retreat groups, and wedding stays. We also have access to more homes on the block to keep your group together during your special events. We are members of the Southern Ocean County Chamber of Commerce, Long Beach Island Business Alliance, and the Jersey Shore Wedding Association. Our connections are your connections. Meeting your needs and making your stay even more enjoyable year round is our goal. We are a Fri.- Fri. check in for weekly rentals. Weddings weekends in the shoulder season rent for $2000 per night. With all bookings - 60% of rental fee due with booking, $1500 security and $500 cleaning fee collected with seond payment of remaining 40% rental fee due 45 before check in unless other arrangements have been made. When booking with a dog there is a $200 charge for small dog under 15 lbs. and a extra $200 security fee and $100 pet cleaning fee. Up to 25lb. dog $300 dog fee, $300 dog security and $100 pet cleaning fee. up to 40lbs. $400 pet fee, $400 pet Security, $100 pet cleaning fee. Larger dogs with be considered please ask. There is a $50 per person , per night for sleeping more than 19 -(20 max.). If you plan to use linen services and haven’t booked them yet please set this up ASAP and may I suggest Cheryl Jones-Bay Breeze Cleaning: email or call mcbayside05@yahoo.com 908-278-9080 Smoking Is Not Allowed. If evidence of pets or smoking are found, a portion of the security deposit may be held. Please let me know if you have pets or need the bed/bath linen services so I can add the charge to the lease. Cancellations will gladly be refunded if we can rent the house out for the timeline at the same price.